God sent the angel Gabriel to Nazareth to speak to Mary, and announce the coming of the Savior. MARY WAS AJewess. She had grown to womanhood in Nazareth, a city of Galilee. And she was expecting soon to marry a good man named Joseph. Both Mary and Joseph were descendants of King David, but they were poor people. Joseph was a carpenter, and he worked with his tools to make a living for himself and to prepare a home for his bride. One day God sent the angel Gabriel to Nazareth to speak to Mary, for God had chosen this young woman to become the mother of the Savior who would soon be born into the world. Mary was surprised when she saw the angel, and she was more surprised when she heard his words. Seeing that Mary did not understand his meaning, the angel told her that God was well pleased with her and he had chosen her to become the mother of Jesus, the Savior of men. He told her that Jesus, her son, would be a King, and that he would rule forever. Even yet the surprised young woman could not understand his words, so the angel told her that this wonderful child would be called the Son of God. While Mary listened the angel told her about the promised child of Zacharias and Elizabeth, the old people who lived in the hill-country of Judah. So the angel left her and went back to heaven. Now, Mary knew Elizabeth, the old lady of whom the angel spoke; for Elizabeth was her cousin. And she knew how Elizabeth had longed to have a child for many years. She believed that her cousin must be very happy since God had promised to give her a child in her old age. Although the distance was great, she wished to see Elizabeth. So she decided to make her a visit. 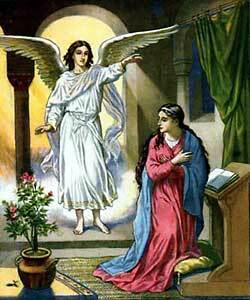 As soon as Mary entered the home of her cousin and spoke words of greeting, God caused Elizabeth to know the secret which the angel had told this young woman in her own home. And Elizabeth rejoiced that Mary had come to visit her. She knew that Mary would some day be the mother of Jesus, the Savior of men. The two women spent many happy days together, then Mary hurried back to her own home in Nazareth. There God’s angel spoke to Joseph, the carpenter, in a dream, and told him about the wonderful secret of Jesus’ birth. And Joseph was glad, for he had been longing for the time to come when the promised Savior should be born. He took Mary into his home and they waited for the angel’s promise to come true.